Colour: Pigment Black, Black, Yellow, Cyan, Magenta, Grey. The Canon Pixma MG6350 printer is more stylish and smart than its predecessors. This is a low profile printer but with comparatively large footprints, aimed at home users who need to print to a very high standard, such as graphic designers or photography enthusiasts. This multifunction printer can print, scan, copy and comes with a built-in Wi-Fi connectivity. Canon Pixma MG6350 ink cartridges are comprised of six colour inks, producing high-quality colour prints. The device weighs 8.4 kg and measures 18.3 x 14.5 x 5.8 inches respectively. It has touchscreen interface with an 8.8 cm colour LCD touchscreen along with touch buttons which light up only when they are relevant. On the front panel, there are two paper trays lying independently one below the other. The top paper tray can store up to 20 sheets of photos while the bottom one can hold up to 125 sheets of plain paper. Below the photo paper tray, there is a CD/DVD disc tray for direct printing on this media. There's also a free Canon Easy-PhotoPrint app for iOS, Android and Windows RT devices for printing images and scanning directly to smartphone or tablet. The print speed of this printer is 15 ppm for black print and 10 ppm for colour files having a resolution up to 2,400 x 4,800 dpi. The Canon Pixma MG6350's flatbed scanner has an optical resolution of up to 2400 x 4800 dpi. It supports USB and ethernet ports for connecting to a network. It also offers a PictBridge port and memory card slots for PC-free operation. The Canon Pixma MG6350 possess great usability and style features. It supports high-quality printing, twin paper trays, automatic Duplex, a great touchscreen interface, Wi-Fi connectivity, mobile printing options and printing onto optical discs. The Canon Pixma MG6350 is a good choice for multifunction inkjet printer as long as you don’t require office-oriented features such as fax facility and ADF support. The device offers six coloured Canon Pixma MG6350 ink cartridges. How to install the ink cartridges in a new printer? 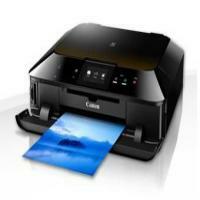 The Canon Pixma MG6350 printer is a good choice as an accompaniment in home as well as offices. When you purchase a new printer, you get a set of Canon Pixma MG6350 ink cartridges, drivers and some softwares along with it. To setup a new machine is not difficult and can be easily done by anyone. Take the new Canon Pixma ink cartridge and open the package. Remove the orange protective tape from the cartridges. Along with it, completely remove the protection film that is a part of the packaging material of the cartridge. Hold the new Canon Pixma MG6350 ink cartridge with the orange cap facing upwards, make sure that your finger does not cover the L-shaped air gap. Slowly turn this orange cap 90 degrees to remove it from the cartridge. Hold the ink cartridge tilted and lower it down into the slot of the colour label respective to it. Push it in place till it clicks. The ink cartridge has now been locked correctly in the slot. Install the other Canon Pixma ink cartridges in a similar way. Be careful that you put the ink cartridge into the slot of their specific colour. If they are not installed in the right colour slots then the printer will malfunction and cause printing problems. Also, make sure that you use only the Canon Pixma MG6350 ink cartridges for the machine to secure a prolonged good print quality and better working of the machine. Close the scanner unit and check the LCD screen for the message of successful installation. The cartridges are now installed. Q. What is the estimated quantity of ink supplied in the Canon Pixma MG6350 ink cartridges? A. The quantity of ink depends upon whether the cartridges are original ones or the compatible version. We at printerinkcartridges.ie provide both the original as well as the compatible ink cartridges with the same amount of ink tanks. The cartridges supplied contain 22ml ink for photo black and 12ml of ink each for coloured ink cartridges. Q. How to print the nozzle check pattern to determine whether the ink ejects correctly from the print head nozzles? After performing the print head deep cleaning, still if the issue is not resolved, it might be possible that the print head may be damaged, in such case contact the nearest service center. Q. How many pages can I practically expect to print using compatible Canon Pixma MG6350 ink cartridge? A. Our Canon remanufactured or refilled ink cartridges are manufactured to Quality standards and therefore we expect these cartridges to print equal or more than the original brand Canon ink cartridges. On moderate one can expect to print around 500 pages from black cartridge, 267 photos from Cyan, 313 photos from Magenta, 274 photos from yellow and 1130 photos from photo black. Q. Do you deliver the cartridges outside Ireland also? A. No, we are sorry but we only deliver to places in Ireland. Q. Is it possible to print wirelessly so that I can use the Canon Pixma MG6350 printer with other computers as well? A. Yes you can print through different computers if your printer is linked to a wireless connection. If you want to do so, you will have to install a software for this purpose from the CD that has been provided with the printer. Unplug the USB cable. Double-click on the Setup buttoned the select download. Once the download of the software is completed, you will see a dialogue box which will ask you to begin the installation process. Click on Next on this box. While you do that, make sure you save the download file for installation next time if required. Mac will ask you for your username and password. Enter both and click on OK. The Installation Setup will ask you for basic information like the country that you live in, time etc. Fills the details correctly. Follow the instructions that you see on the screen. Add the Canon Pixma MG6350 printer to the list of printers on your system. The setup will now ask you to take a test print, do that. Once you have taken the print, click on Exit on the dialogue box. The wireless LAN software has been installed on your system. Q. The printouts that I take using the Canon Pixma MG6350 printer, show smudges along the edges. Could this be because of the Canon Pixma MG6350 ink cartridges that I have recently installed? A. The smudges along the edges are not caused by the Canon Pixma MG6350 ink cartridges. The cause for smudges may be jammed paper. Paper jams occur due to poor paper quality or temperature differences and humidity in the environment. To remove these paper jams, you will have to open the operation panel of your printer and inspect. If you see any jammed paper then gently remove it. While you are doing this, unplug the printer. If the paper is seen under the printhead holder then very carefully move the print head holder to the right or left side and then remove the bits of paper. Slide the holder back to the position it was. When you print something and there is a paper jam, the ink from the Canon Pixma MG6350 ink cartridges blot these bits of paper and smudge along the paper that is being printed. Once the jammed paper is removed, the problem of smudging will be solved. Q. What is an ink absorber? Do I need to often change the ink absorber in Canon Pixma MG6350 just like the Canon Pixma MG6350 ink cartridges? A. When the print head nozzles are clogged and the cleaning cycles are run then some amount of ink is used from the Canon Pixma MG6350 ink cartridges specifically for this purpose. The ink absorber is a unit that absorbs this excess ink. The ink absorber keeps the quality of printing good by absorbing any excess ink. Just like the Canon Pixma MG6350 ink cartridges get used up, the ink absorber gets full. The printer will display a message saying that the ink absorber is full. This is when it needs to be replaced. However, the replacement cannot be done at home. You will have to take the help of the service centre for this. Make sure that once the ink absorber is full, the printer is not tilted. If you are not careful about this, then the ink may leak from the ink absorber. This may damage your printer. You must not try to remove the ink absorber on your own as it will damage the printer.